Called simply Nature Lab, this new embroidered fabric forms the heart of Pollack’s spring 2019 collection. For Textiles graduates Rachel Doriss 99 TX and Molly Haynes 14 TX, fruitful hours spent absorbed in RISD’s Nature Lab when they were students here continue to resonate even years later. Both found joy and inspiration in examining the lab’s quirky mix of specimens and selecting pieces—crystals, spores, a seedpod, a delicate skeleton or fan of coral—to further observe through drawing. 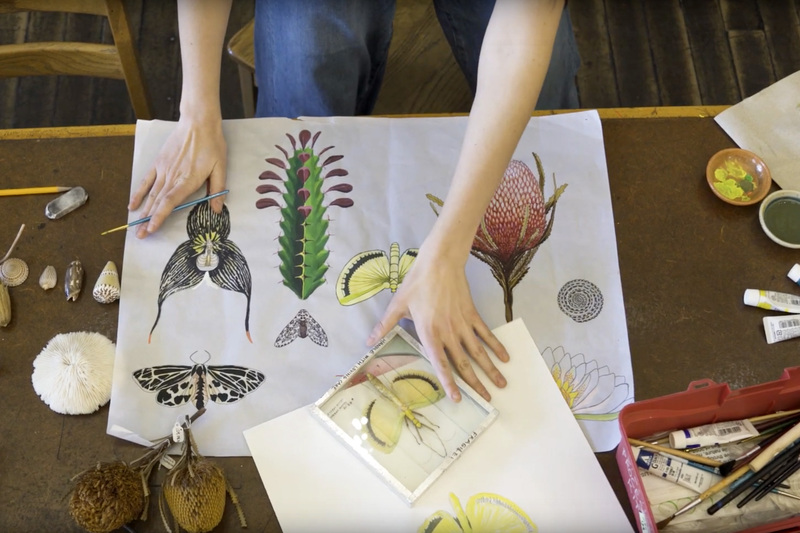 When the two began thinking about designing the spring 2019 collection for Pollack—the NYC-based textiles studio where they both now work—they initially gravitated towards botanical drawings, but didn’t like the idea of literally basing their designs on other artists’ work. Remembering the marvelous patterns and designs in nature she had studied in the Nature Lab, Doriss suggested that Haynes take a research visit to their old stomping ground at RISD. As Pollack’s vice president and design director, she’s responsible for overseeing the development of each new collection. Haynes, a designer at the studio who worked at the Nature Lab as a student, jumped at the opportunity, spending a day on site pulling out specimens and making preliminary drawings. Back in the studio in NYC, she devoted much of last summer to painting a series of detailed gouache studies. Knowing that the images would ultimately be embroidered on a natural linen ground, Haynes and Doriss then played around with laying them out in a pattern reminiscent of classical botanical inventories. They chose colored threads to match the painted studies and also simplified the composition through each iteration of the process. 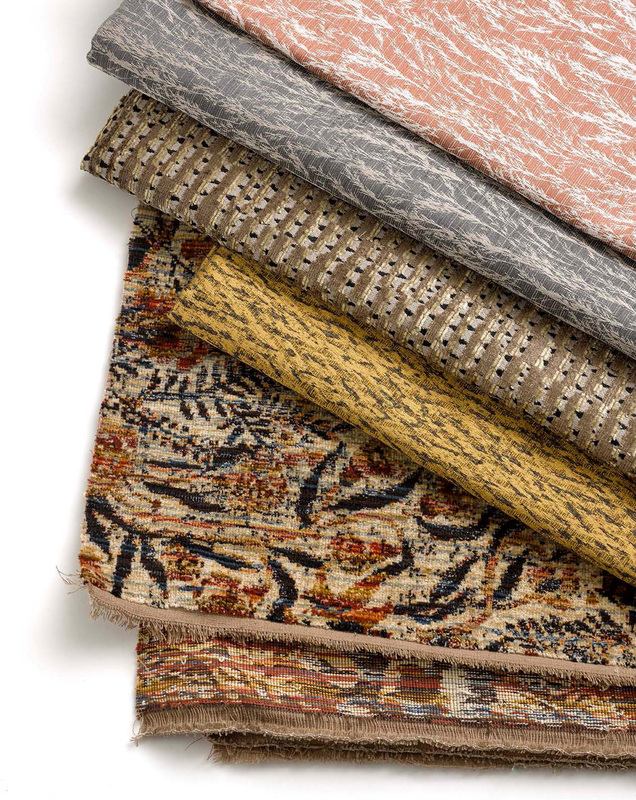 Called simply Nature Lab, the light upholstery and drapery fabric captures the intricate detail and colors of Haynes’ original artwork and forms the core of the company’s new collection by the same name. Five other designs—called Botany, Breezy Point, Current, Songbird and True Horizon—round out the collection, which focuses on the extraordinary beauty in nature’s own laboratory—from water and air to flowers, leaves and feathers. Industrial design students set up shop in the Nature Lab, designing aquaponics systems with potential application on campus. The Nature Lab culminates its 80th anniversary celebration with a thought-provoking exhibition and symposium probing our complex relationship with nature. Funding from a $280,000 EAGER grant will enable RISD to develop a maker space and K–12 curriculum focused on bio-design and its relationship to real-world problems.